Poison Oak has "leaves of three" as shown in the upper left. 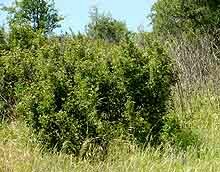 They can grow in isolated clumps or in huge groves. Note that in this climate, the plant grows fairly straight up (right -- note the dead stems to the right of the clump also). 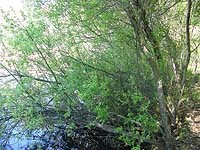 Native willows are also common -- mostly near water, but not always. Valley Oaks have these huge crooked branch structures. 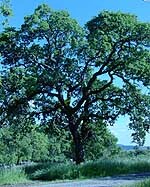 Oaks were very prolific this year with a season of long even rains. This drainage ditch probably contains 250 new trees. There are other "nurseries" I've found on other parts of our property this year as well. 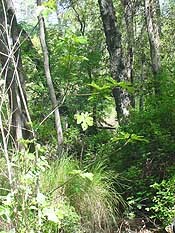 Fig trees are fairly common around streams and creeks. Digger pines grow quickly and are very common. They get to be huge trees but have a short life and a shallow root system. Even the biggest ones blow down fairly regularly, especially when the soil is saturated. 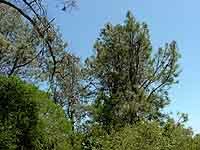 Compared to other trees in the area, their foliage is more of a blue-green. In this row of thistle you see one variety at various stages of growth. The mature plant on the right is well over 5 feet tall, so it behooves you to use your Roundup on them early so you don't have to use as much as when the plants mature. This is another form of thistle but much harder to get rid of. It appears more blue-green and doesn't show up until the weather is very hot. On the left you see a new plant. If you're going to try to kill this with Roundup or Remedy, you should try to hit the new plants. They grow very quickly and they have such a sparse amount of foliage, they are very difficult to spray later in their development. Also, mow areas with star thistle frequently (or if the area is too dry to mow, use a weed eater). Try to keep cutting it back before it develops a flower and seed. Bush with stickers... flowers are pretty but smell bad. 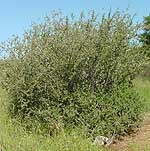 These are very prolific and full of HUGE thorns. Great for quail and birds to nest. Nasty for people.